Young Girls at the Piano by Renoir - no-risk guarantee! In late 1891 Renoir was invited by the French government to submit a painting for a new museum in Paris. 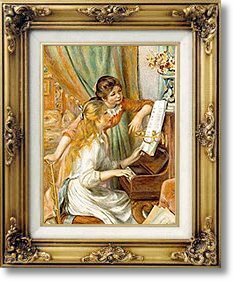 He chose two girls at the piano as his subject and was very much aware of the intense scrutiny with which his painting would be viewed. He developed and refined the composition in a series of five canvases. This painting and another nearly identical version are widely regarded as the most accomplished examples of this intimate scene of bourgeois domestic life.